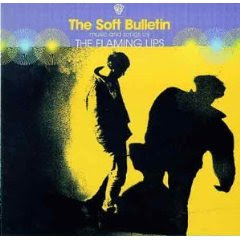 For Indie Baroque Pop at its best you can always rely on The Flaming Lips, with their fascinating mix of Indieness and almost prog sensibilities this album is a joy to listen to throughout. The songs are, however, extremely catchy, with the first tune getting further into your head by being repeated at the end in a slightly different version. The Flaming Lips make their music so good mainly for two reasons, one is the lyrics, the other one is managing to always have a great musical hook even if the sound is extremely full. Very good album, even if not perfect. The album was considered to mark a change in course for the band, with more traditional catchy melodies and accessible-sounding music (their previous album, 1997's Zaireeka, was a quadruple album of experimental sounds meant to be played on four separate stereo systems simultaneously) and lyrics that were more serious and thoughtful in content. The album was noted for its fusion of ordinary rock instruments, electronic beats and synthesizers. Its large, layered, symphonic sound has also earned it a reputation as the Pet Sounds of the 1990s from a few critics.